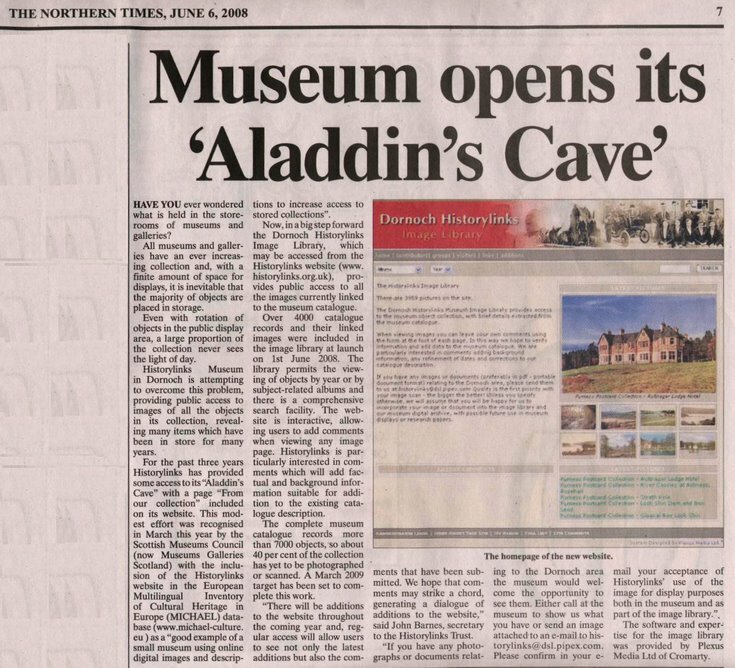 Northern Times article, published on 6 June 2008 with title "Museum opens its 'Aladdin's Cave' " publicising the launch on 1 June of the Historylinks Image Library. At launch the image library, accessed from the existing website, had over 4000 catalogue records and their linked images. The image library project extended the modest effort, 'From our collection' , on the existing website to provide public access to objects which could not be displayed in the museum. The original example of the museum's use of online digital images gained recognition by the Scottish Museums Council with inclusion of the Historylinks website in the European Multilingual Inventory of Cultural Heritage in Europe (MICHAEL) database.